Twitter has finally brought back exclusively chronological timelines, more than two years after phasing them out. In a move many would characterize as restoring a functionality it never should have removed in the first place, the social media platform announced on Monday that it will now allow users to fully opt out of “curated” timelines, in which “top-ranked” tweets — according to an algorithm, anyway — are shown first, above more recent tweets displayed in chronological order. Users have always had the ability to turn off the curation function, which is listed as “Show the best tweets first” in Twitter’s settings menu — but only in a limited sense. Even users who disabled the “Show the best tweets first” setting were shown curated categories of tweets they couldn’t opt out of seeing (including popular tweets from people they didn’t follow) and which affected the order of their feeds. In essence, there was no such thing as a purely chronological timeline. But now, citing user feedback, Twitter has restored the ability for people to view their feeds in all their completely uncurated glory. The changes followed a wave of clever workarounds and DIY filtering shared among users in an effort to achieve a change that many people wanted, but Twitter seemed unwilling to make. You know, I’ve had the domain https://t.co/Nu7N4UZsmF for years now, and never did anything with it. I just made it a forward to your filter url, for the benefit of mankind. Baio’s simple yet much-lauded hack was followed by multiple viral tweets about how to tweak your Twitter settings to reverse-engineer the chronological timeline of your dreams. A Twitter spokesperson told BuzzFeed that the timing of the chronological timeline’s sudden reappearance was just a coincidence. After the announcement, the mood among many Twitter users ranged from delighted to jubilant to ecstatic. Did Twitter just restore the chronological timeline? Is that nightmare over? The chronological timeline is wonderful. I’m seeing followers that have been hidden from me for *ages*. The only problem I have is that eventually, twitter stops loading new tweets and I have to start over. The origins of Twitter’s algorithmically curated timeline date back years, with the platform implementing some of its components gradually. The company first began to officially phase out a chronologically organized timeline in February 2016, when it introduced the algorithmic timeline — in which “top-ranked” tweets, scored by a “relevance model,” were automatically curated to appear first and most frequently. Often, people would see tweets from users they didn’t even follow, above more recent tweets from those they did. Initially, people could opt-out, but that wasn’t true for long. By early 2017, many users were complaining frequently of seeing tweets from people they didn’t follow, as part of Twitter’s ongoing attempts to recommend content to its audience. A Twitter spokesperson emphasized to Vox this week that, while the company has restored the chronological timeline option in response to user feedback, its research has shown that people find Twitter more relevant and useful when they’re shown the “best” tweets first. You might be wondering why being able to view tweets chronologically ever became an issue at all. Who cares what order tweets are displayed in? Aren’t they all just tweets? Well, yes and no. The emphasis on curated timelines and recommendations across several social media platforms — Facebook and Instagram also surface content based on what an algorithm thinks users will be most interested in — has often baffled and frustrated users. While the platforms say that filtered and curated timelines provide more value to users, users themselves have frequently said that, in practice, they are regularly shown content that’s already several days old, which is served up instead of newer content they would prefer not to miss. People who revert to a chronological feed on Twitter will undoubtedly miss seeing the most popular tweets on any given day. But the ongoing friction between social media platforms and their users over the desire for a chronological feed is about much more than just a preference to read things in order. It’s also about a growing distrust and weariness of algorithmic curation, the way social media algorithms increasingly help to spread misinformation, and the loss of user control over what they see on their feeds. All of this is crucial to understanding why so many Twitter users are loyal to the platform despite Twitter’s ongoing controversies and numerous failures. When it’s unfiltered and uncurated — and when your feed isn’t overrun by bots, fascists, and/or disingenuous trolls — Twitter can fulfill its stated mission to serve as a “public square,” where ideas get promoted because people find them worthy of discussion, not because a robot thinks you might like them. That is, it’s democratic. And at a moment when people are worried about the literal death of American democracy, that’s not insignificant. To be fair, a chronological timeline isn’t a cure-all for Twitter. Between the bots, the trolls, the fake news, the Nazis, and the algorithmic curation that’s unavoidable on other parts of the platform (namely in hashtag feeds and the search function), even reverting to a chronological feed won’t give you a completely “neutral” view of Twitter — that’s an idealistic dream that seems increasingly out of reach. But the simple option to read tweets chronologically will at least give users more control over a system that often feels uncontrollable, and hopefully remind us of what Twitter can be at its best. If you’d like to restore your timeline to a chronologically ordered view, navigate to your “Settings and Privacy” page, which you can get to by clicking your Twitter avatar. 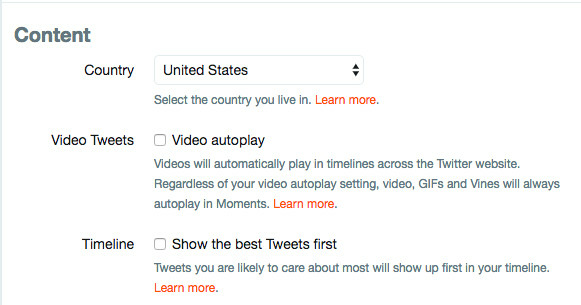 From there, scroll down to the option to “Show the Best Tweets First.” You want to make sure that option is unchecked. As part of its announcement on Monday, Twitter explained that this week’s changes are just a first step, and that once they’re fully implemented, users will have the ability to easily toggle between a chronological feed and a curated one. With that final change, hopefully we’ll have the best of both worlds, and Twitter users can resume their other favorite Twitter activity — complaining about the lack of an edit function. Meanwhile, it’s your move, Instagram.